Supermicro has grown from a Silicon Valley start-up to a multi-billion dollar Fortune 1000 company. The establishment of the company as a provider of leading enterprise data center solutions has continued to drive impressive and consistent growth for a quarter of a century, impressively achieving 6x revenue growth over the past ten years while being profitable every year since inception. 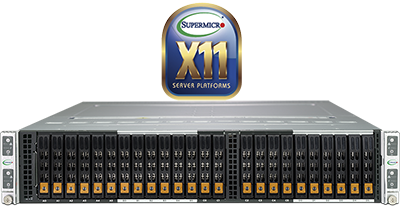 The Supermicro BigTwin is the first and only 2U multi-node system supporting the highest performance processor, memory, storage, I/O and an incredible 30% better thermal capacity. The 5th generation of Supermicro's Twin architecture is fully optimized for today's diverse workloads and architected for further technology breakthroughs. Performance: Supporting the latest Intel Xeon Scalable processors up to 205W, the BigTwin achieves incredible performance in a 2U multi-node platform. The latest processors from Intel incorporate Ultra Path Interconnect (UPI) technology for significantly improved communication between CPUs to reduce latency and provide extra bandwidth for intense workloads. Each node of the BigTwin supports up to 3TB DDR4-2666MHz in 24 DIMM slots for dramatically faster and increased memory capacity compared to previous generations of Twin systems. With up to 12 hot-swappable 2.5" drive bays per node, storage performance is accelerated with options for All-Flash NVMe, SAS or SATA drives. Density: BigTwin systems boast incredibly high density with up to 4 hot swappable nodes in a 2U form factor, and double the I/O capacity of competitive 2U solutions. Support for Supermicro I/O Module (SIOM) enables flexible networking options of 1G, 10G, 25G, or 100G Ethernet or 100G InfiniBand/Omni-Path and frees up 2 low-profile PCI-E 3.0 x16 expansion slots per node. Efficiency: Supermicro's Twin architecture is designed with power and cost efficiency in mind. The BigTwin reduces power consumption with shared cooling and power design, leveraging redundant 2200W high efficiency (96%) power supplies. Maximum compute in a 2U system enables data center footprints to be reduced by 50% compared to standard 2U servers with equivalent performance. ServerDataWorks.com is a division of Virtual Graffiti Inc, an authorized Supermicro reseller.